The full ‘Safety in Depth’ system encompasses the material itself, canisters, assemblies, special packages called ‘casks’ or ‘flasks’ and the protection provided by the reinforced double hulls of the PNTL fleet. Together, these provide a series of independent barriers between the radioactive material and the outside environment. This safety system provides much greater protection than typically exists for other hazardous cargoes such as chemicals, oil and liquid gases, which are shipped far more frequently. It also removes reliance on specialist emergency assistance being available from countries adjacent to shipping routes. 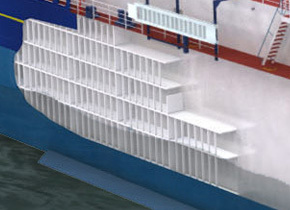 The cargo compartments of the PNTL fleet are protected by a double hull configuration, extending to twenty per cent of the beam on both sides of each ship. In addition, the hulls are reinforced with 400 tonnes of extra steel to withstand collision damage.